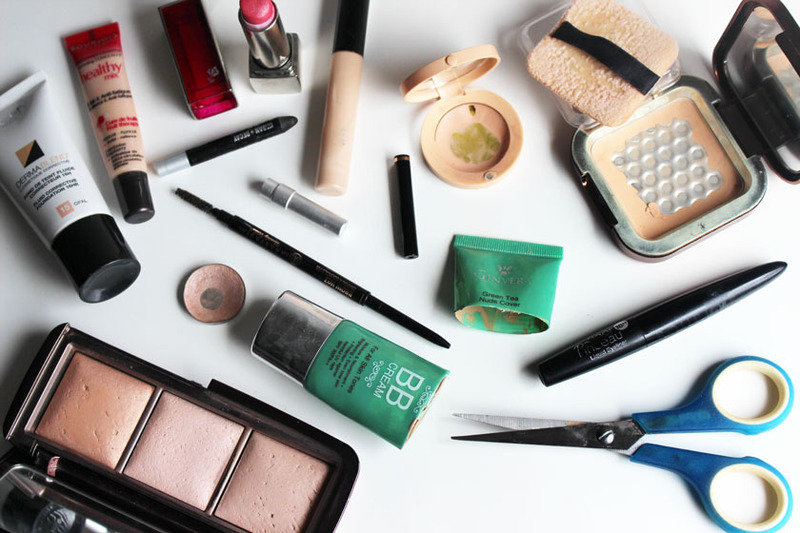 There is nothing I love more than photographing brand new lipsticks or palettes, but... today I want to talk about my most used and well loved makeup products. The ones I either used up, repurchased, hit the pan on or simply used every single day since I got them . Are you ready for some recommendations? I simply can't live without the Collection Lasting Perfection Concealer (£4.19). It is fantastic and super cheap. You NEED it in your life and you won't regret buying it. It is probably my most repurchased makeup product. 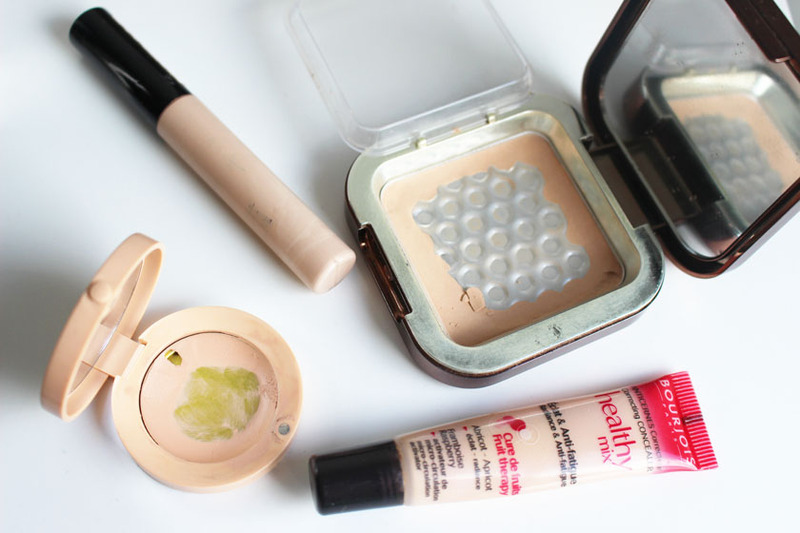 I also love using the Bourjois Happy Light Concealer (£8.99) on dry areas that need coverage and the Healthy Mix Concealer (£7.99) when my skin is more on the oily side. 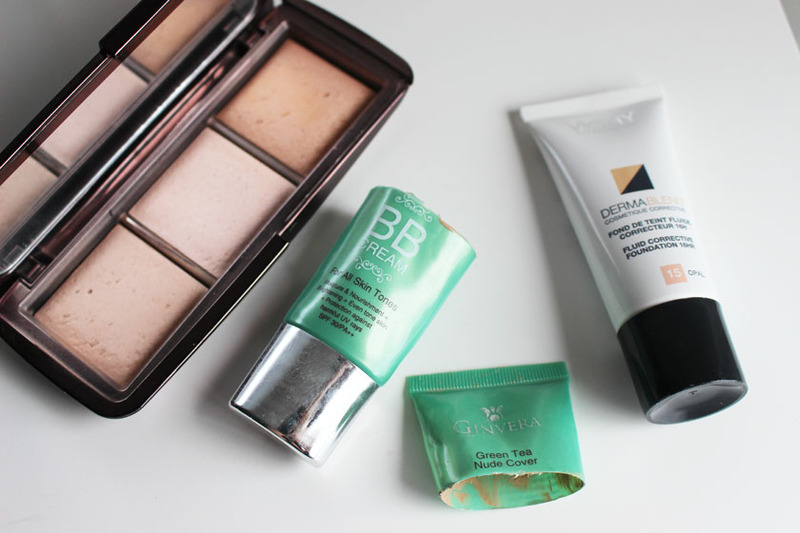 I included all of these, because they have all been repurchased, which means one thing - LOVE! Another product I am addicted to for adding extra coverage is the Rachel K CC Pressed Powder/Foundation* (£25.95). It is perfect for setting my base and concealing any scarring etc. As you can see, I hit pan on it. If you have acne or acne scarring, you will love it. I thought that I won't need a new Hourglass Ambient Lighting Palette (£56.00) anytime soon, but... I just hit pan on the middle shade. Whaaaat? I am devastated. It's hard to see, because the base is almost the same colour as the powder, but yes... I hit pan on the left side of the middle shade and I think I have to start using the other shades more. Anyway... I am still obsessed with this palette and I use it to set all makeup looks and add radiance and luminosity to my complexion. It is a pricey palette, but worth every penny! I have been repurchasing Vichy Dermablend (£14.45) for over 7 years and it is still my number 1 foundation. If all my makeup disappeared, it would be my first purchase. It covers EVERYTHING and it gives a relatively natural finish. I can't recommend it enough for those who want a flawless finish and full coverage. The Lancome Color Fever Lipstick in shade 312 (£21.00) is actually the lip colour I wore on my wedding day and I will treasure it forever :) I use it on special occasions and I will probably end up buying a new one, if I can find it. It seems to be sold out everywhere. It is stunning! Lancome lipsticks are amazing! 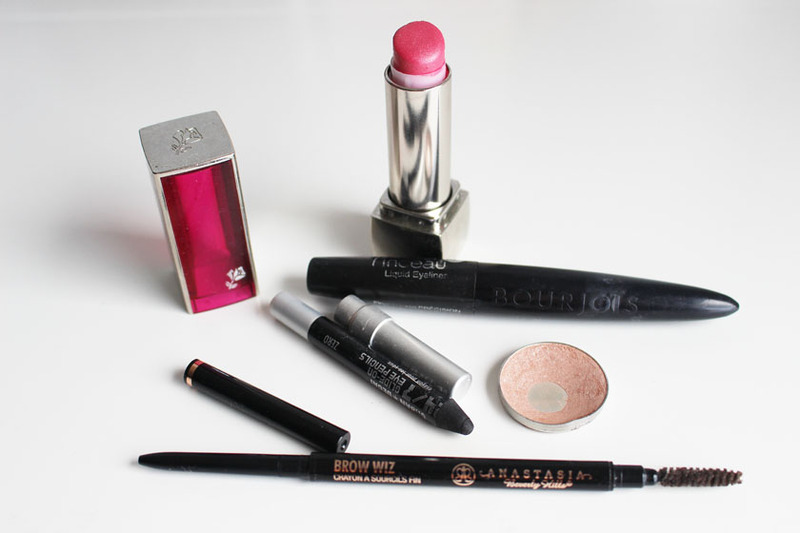 You probably already know how much I love the Bourjois Liner Pinceau Liquid Liner in Black (£6.99). I talk about it all the time and it is my Holy Grail product. It is the best liner in the world in my opinion and I have been repurchasing it for years. Easy to apply, long lasting and ultra black. Perfect! My most used eye pencil is the Urban Decay 24/7 Glide On Pencil in shade Zero (£13.25). It is creamy, easy to apply and it does not budge! I also adore the new shade Perversion, which is the blackest black! The best eye pencils on the market. My favourite and most used brow product is the Anastasia Brow Wiz in shade Brunette (£15.50). Yes, it's pricey, but... it is the most natural looking brow product for me. The nib is super fine and you can draw very precise, hair-like strokes with it. The last item I want to mention is MAC Fanfare Lipstick. (£15.00). My first one was a giveawy prize and I picked the shade myself, but I used it up really quickly and I just had to buy a new one. It is a perfect everyday pink, that can be worn all year round and suits all skintones. 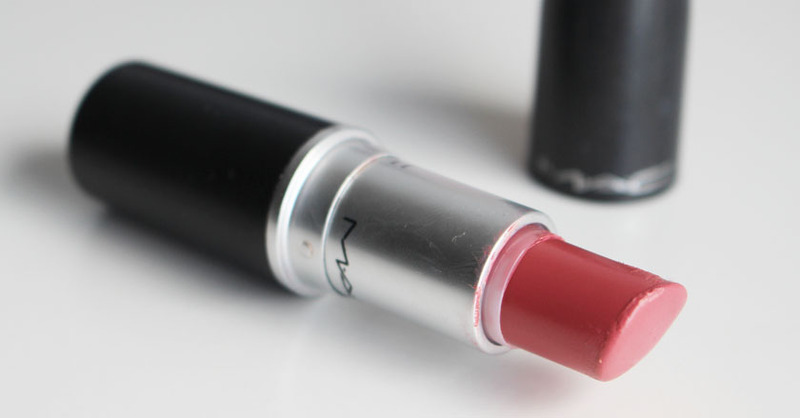 If there is one MAC lippie you need, it is this one. I hope you enjoyed this post. 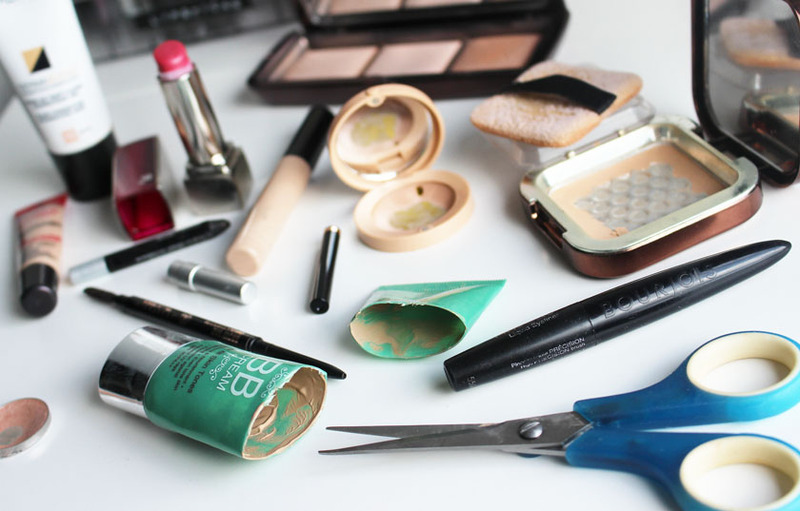 let me know what is your most used makeup product? Is there anything you keep repurchasing?